Rugged. Reliable. And versatile. EMB-112 Tucanos serve 16 air forces – as well as civilian operators – worldwide. Brazil's pioneering turboprop trainer and light-strike machine proved an efficient, economical option to expensive jets. And it helped fuel a worldwide revolution in military aircraft operations. 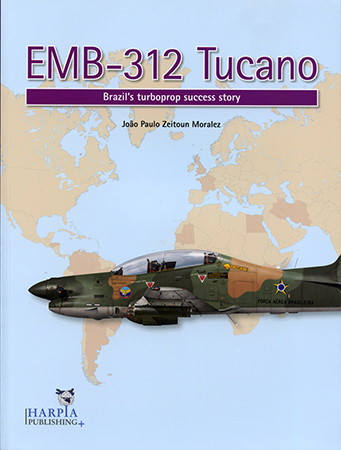 Now Harpia tells the whole terrific tale in EMB-312 Tucano: Brazil's Turboprop Success Story – from design and development through rollout and testing to domestic and worldwide service. Illuminating, informative commentary by prominent program participants add pungent perspective to details of aircraft origins and operations. And exciting, intriguing action accounts further flavor Moralez's saga. Over 100 excellent color and B&W photos also illustrate the account. Images canvas Tucano colors. And detail shots showcase armament options, ejection seats, instruments, and interiors. But with extended captions and FS color references, over 60 gorgeous color profiles by Murilo Camargo Martins really dominate visuals. Add a brace of four-view color spreads. Include nine pages of worldwide unit insignia. And modelers will certainly value this vivid volume. But why no top views of standardized "Vietnam-style" Tucano camouflage patterns? Ditto for starboard aspects. Hobbyists really need those specifics for accurate color placements. Most other concerns remain minor. And none substantially diminishes enjoyment of this terrific tome. That's "Zlin", not "Zlim", for instance. What exactly constitutes a "cell"? And while the first few chapters contain excellent English, some subsequent sections – Egypt, for instance – sport rather awkward phraseology. A brief "After Tucano" chapter, abbreviations glossary, technical notes on Brazilian- and British-made machines, detail remarks on absolutely every operational Tucano, ORBATs, and an index complete contents. But Moralez's stunning survey doesn't end there. Harpia's forthcoming study of the EMB-314 Super Tucano will doubtlessly resume the saga in similarly sweeping style. I can't wait. Tackling HobbyBoss's 1:48 EMB-312? Or Premier's 1/72 effort? Or Airfix's Short Tucano? Buy this brilliant book. Then line-up behind me for Harpia's Super Tucano sequel. With thanks to Harpia Publishing for the review copy.